Create and sell your own jewelry in this exhilarating time management game! Elly's dad has retired from the family jewelry business and passed on his store to his daughter. You must help Elly achieve her family's dream of becoming a leading jeweler by making sparkling diamond rings and dazzling gold necklaces while customers wait. Deliver your merchandise in time and they'll leave with a smile. Miss the mark and your reputation will take a hit! 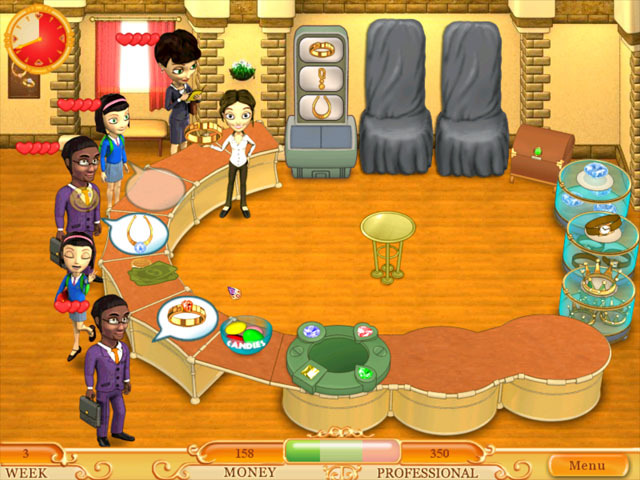 Create and sell your own jewelry in this exhilarating time management game! ...... Miss the mark and your reputation will take a hit! Can you take Elly and her family to the top? Qweas is providing links to Jewelleria 2011 as a courtesy, and makes no representations regarding Jewelleria or any other applications or any information related thereto. Any questions, complaints or claims regarding this application Jewelleria 2011 must be directed to the appropriate software vendor. You may click the publisher link of Jewelleria on the top of this page to get more details about the vendor.